Happy Saturday, blog friends! I hope you are having a lovely Easter weekend so far. 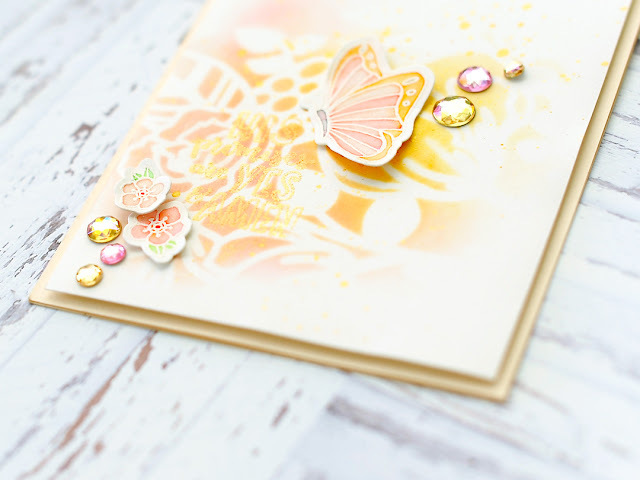 I've got a pretty little card to share with you today, using some Pinkfresh Studio stamps & dies that happen we to have an amazing promotion on this weekend! 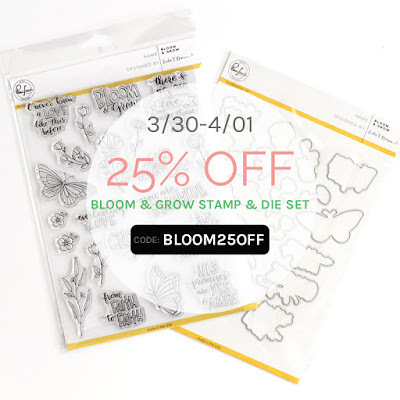 Through tomorrow night (11:59pm CST), you can get 25% off Bloom & Grow stamps and dies when you purchase both! Just add both to your cart, and use the promo code BLOOM25OFF upon checkout. This is such a lovely stamp set, and while faith based, it includes many sentiments that could be used for other purposes. 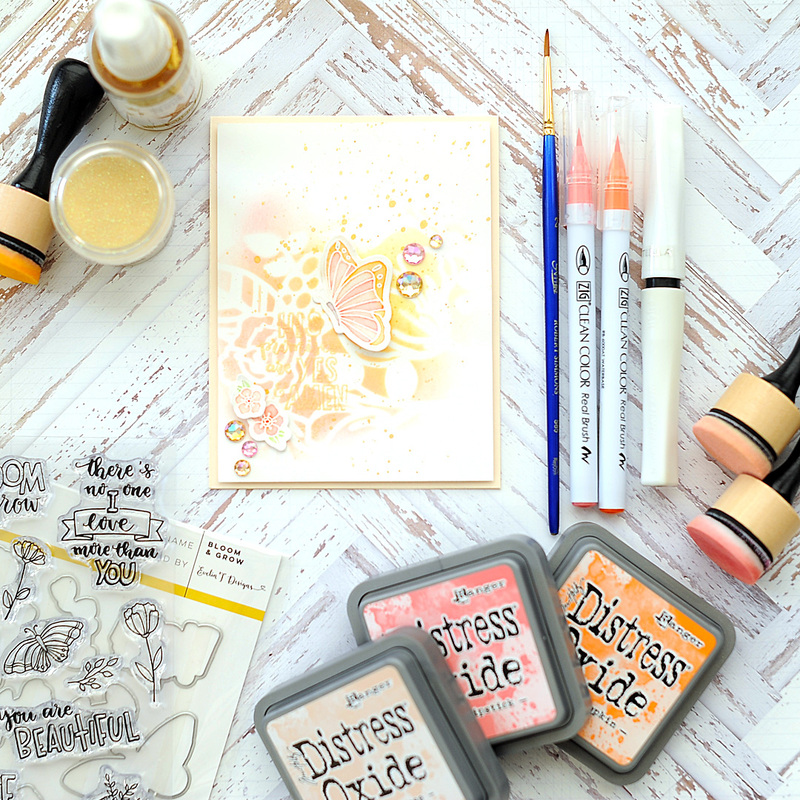 Now is a great time to pick up the Distress Oxide inks you might be coveting, add some Alcohol Ink colors to your collection, or some new Embossing Powder colors! 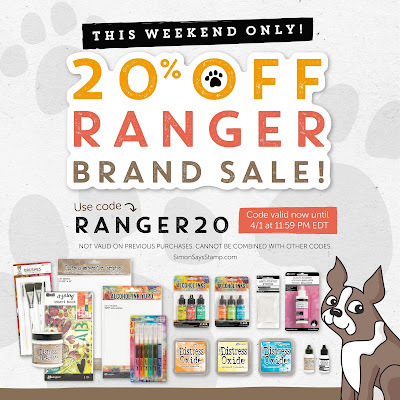 I've used quite a few Ranger products on my card for today, and they will all be linked below if you are looking to recreate it. Alright - done with the sale info, and now let's get to my card! 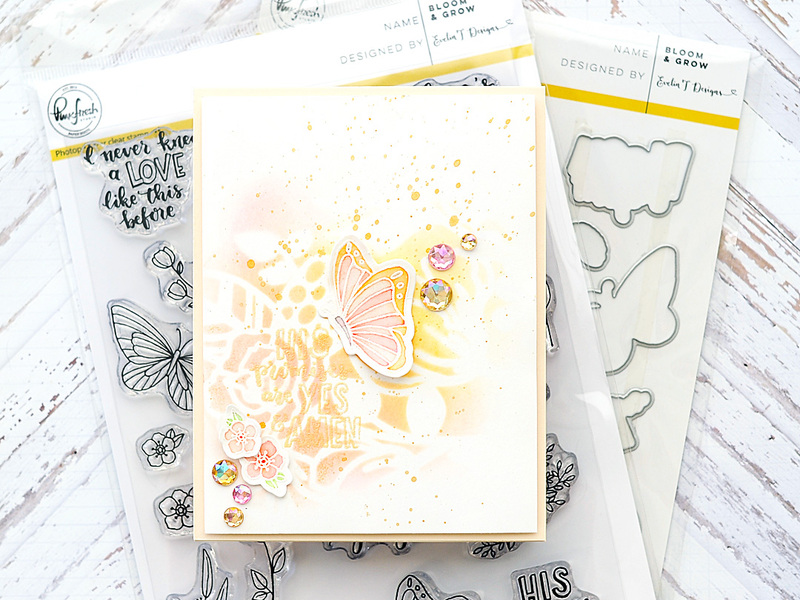 With Easter being tomorrow, I really wanted to focus on the sentiment from the stamp set that says, "His Promises are Yes & Amen". Isn't that just beautiful? It truly ministers to my heart & soul. 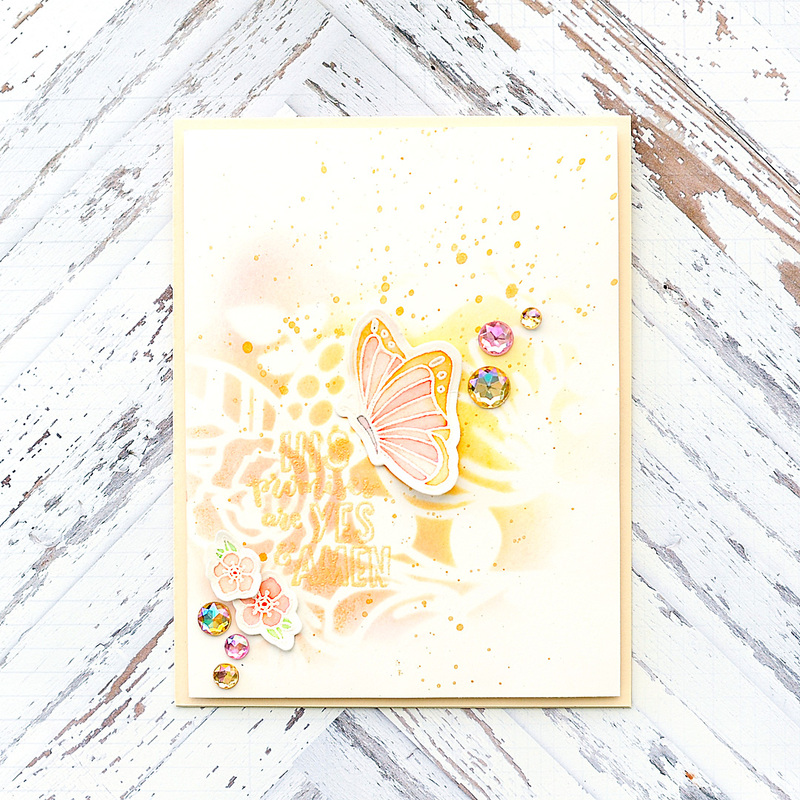 To start, I created an A2 card from cashmere cardstock and set aside. Next I cut white cardstock slightly smaller, then taped it down with a floral stencil over top of it and proceeded to blend some distress oxide inks to it. 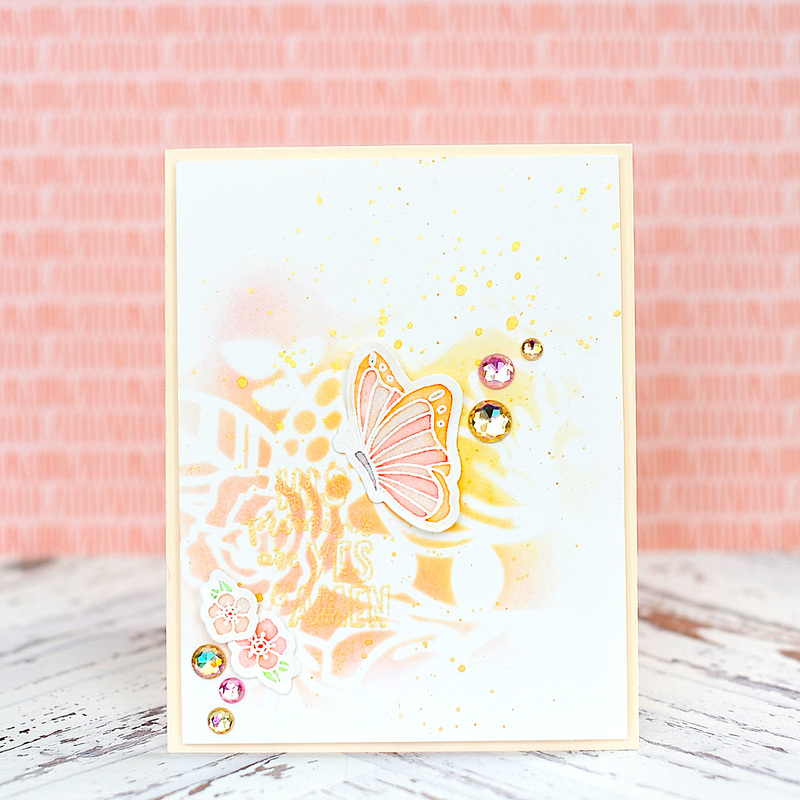 The stencil I used is a 12x12 floral stencil from the older Dear Lizzy "Serendipity" collection. I couldn't find it for sale anywhere, but you can always swap it out with one you have on hand! Next I hit it with my heat tool to set the oxide inks up a bit, then stamped & heat embossed my sentiment from the Bloom & Grow stamp set to the lower left corner of the inking. I love how light & iridescent the sentiment turned out, but it was definitely hard to photograph. 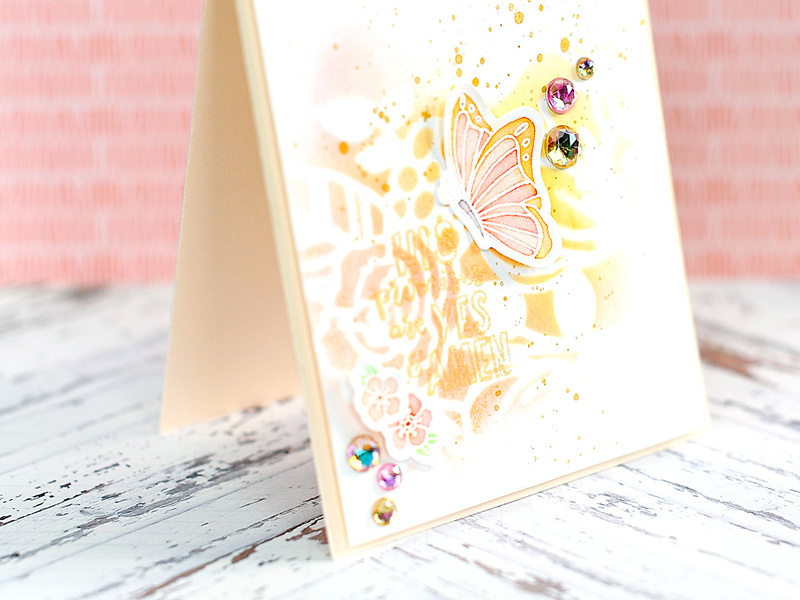 If you prefer bolder sentiments, try an opaque gold embossing powder, or a darker pink! Once finished with the sentiment, I flicked some gold lame Color Shine to it and then let it dry. After it dried, I mounted the inked and stamped block to the card front with foam to give it nice dimension. 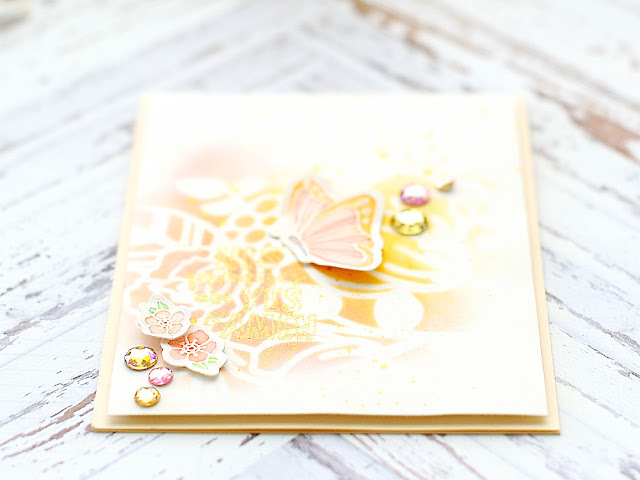 Next I stamped & heat embossed the butteries & blooms in white to white cardstock. Then I proceeded to watercolor them using my Zig Clean Color Real markers and a size 2 brush. 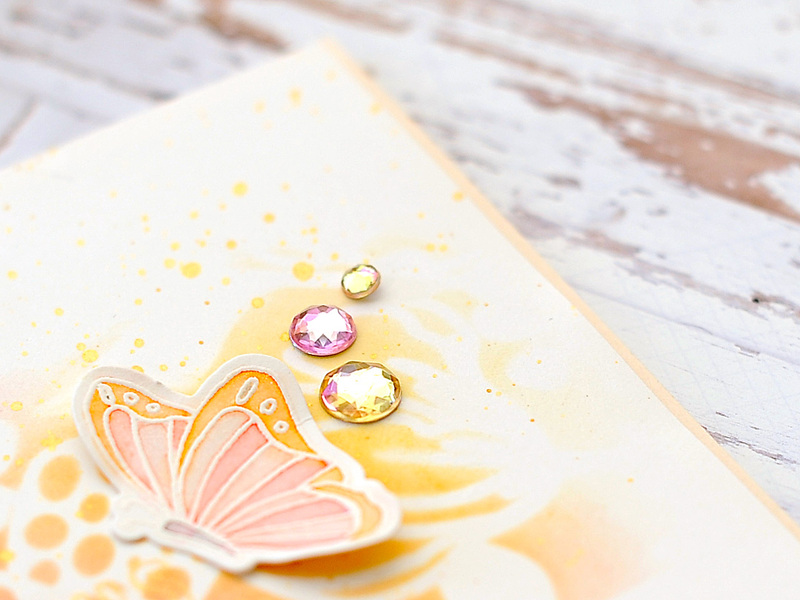 Once dry, I added some shimmer to them with my Wink of Stella pen and then cut them out with their coordinating Bloom & Grow diecuts. To finish the card, I adhered the butterflies & blooms to the card front, then accented with my signature jewels tucked here & there! When I looked at the finished product, I realized that my Wink of Stella pen hadn't produced in the way it normally does. I looked around on the web, and realized that there is typically enough glitter in it to refresh the pen once & add some water. So I did just that, then reapplied the Wink of Stella to the butterfly & blooms. They were much more shimmery after that! I really hope that you like my card today, and hope that you might feel encouraged by it too. Yesterday I shared something I wrote to my personal Facebook page that I thought I would share here as well. "Two years ago I posted this to Facebook. Still reeling from the death of Ellie, but cautiously filled with the hope of Layton. I believed with all my heart that this was the part in our story where we would see and feel redemption. That all the loss, grief and sorrow would be for a reason. It wasn't. We suffered even more loss, grief and sorrow just months later. I was left broken, questioning and angrier than I've ever been in my entire life. This time last year I basically just survived. I cried through worship. Sat through a sermon I likely didn't listen to. But I didn't feel anything more than hurt. I didn't feel loved by my Creator. I didn't see the point of all my suffering. And I surely didn't believe that there would ever be redemption in any of it. I still don't understand everything we've been forced to face, and I'm not sure that it is meant to be understood...just carried. And there won't be redemption in this part of my story this side of Heaven - but that day…oh that day on the other side of the veil. My shattered little heart longs for that moment when I come face to face with my sweet Ellie & Layton again. But I've realized that redemption came for me long ago on that dark day when Jesus died for me on the Cross. I don't believe in a God that hasn't suffered. I don't believe in a Savior that hasn't wept for & mourned with the grieving. As my broken heart has healed little by little, God continues to reveal these seemingly simple reminders. They aren't earth shattering, but, they are honest & true. It is Friday. But Sunday…Sunday is definitely coming. It doesn't mean we won't be bruised & battered when it gets here….but friends, it WILL get here. Luke 21:27-28 - At that time they will see the Son of Man coming in a cloud with power and great glory. When these things begin to take place, stand up and lift up your heads, because your redemption is drawing near." 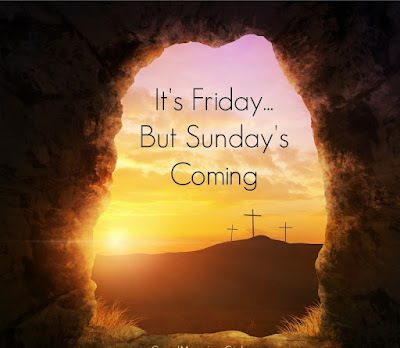 Have a great rest of your Easter weekend! Be blessed. Thank you for sharing your story, Lea. It is an encouragement to hear of your faith, trust and hope even through such difficulties as you have experienced. I am confident that you will comfort others with that comfort that you have received from the Lord. Indeed, His promises are, "Yes, and amen." Beautiful card, Lea! I also really appreciated what you shared. Hugs! Thank you for sharing your gorgeous creation and your thoughts and words of wisdom. I adore this card - so uplifting and peaceful. 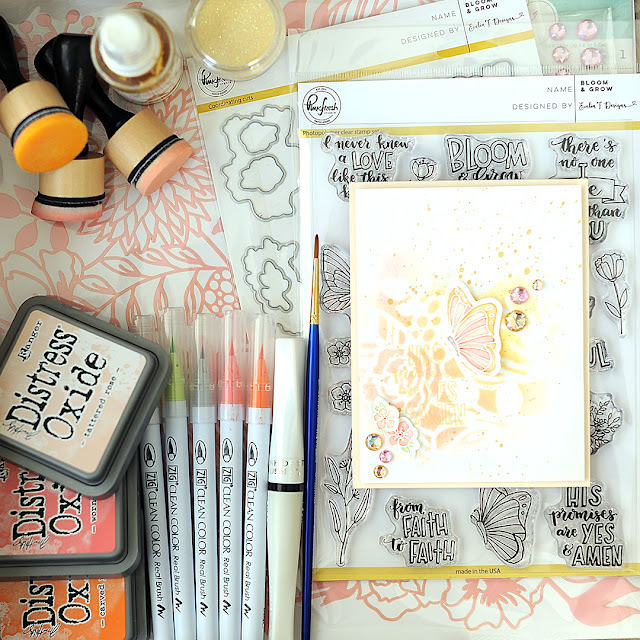 Thanks so much for linking up with JUGS this week! Great work! And thanks for opening your heart to us, every time I read your story, I just feel more hopeful in life and in everything I face each day, big hug to you and have a blessed weekend! Lea this is very beautiful, the softness to it is just perfect and i love the muted sentiment. That.card.is.gorgeous!!! 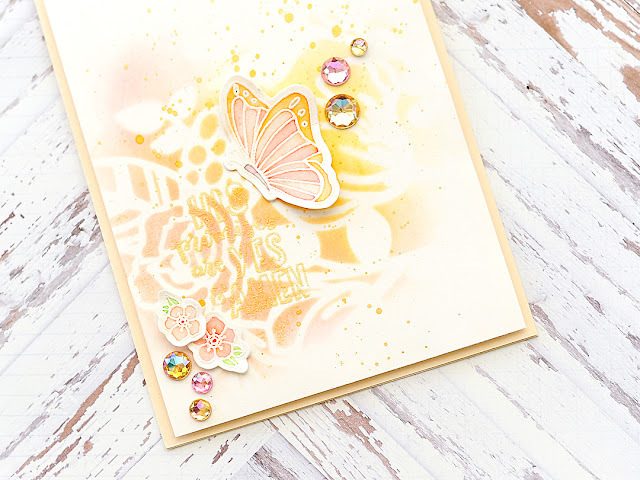 I love all of the "surprises" in your dreamy collage, especially the stenciled rose and beautiful butterfly! What a pretty card! 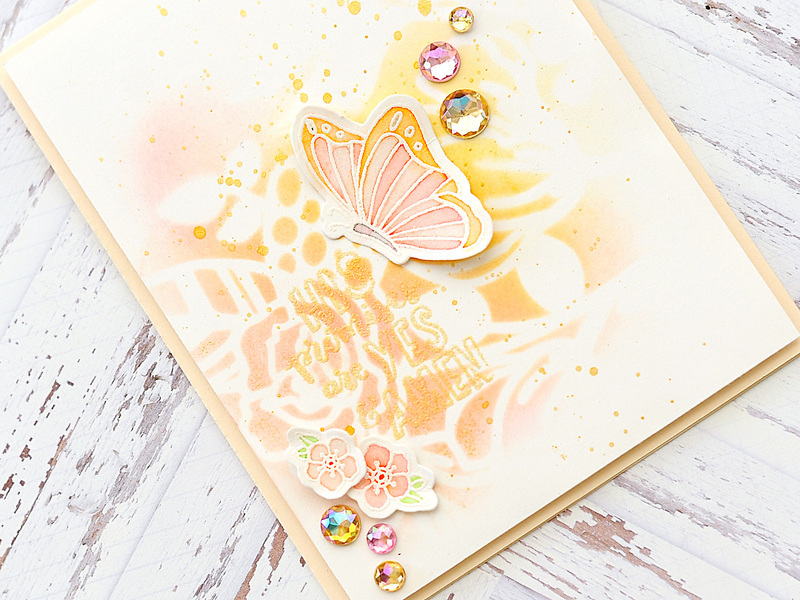 I love the soft subtle colors and that butterfly. Thanks so much for playing along with Just Us Girls this week.